Lucy Lavely and Steven Rattazzi in Arthur and Esther. Photo by Hunter Canning. BOTTOM LINE: Ross Howard's poetic two-hander tells a story about love, loss, and the distance between despair and regret. Ross Howard’s Arthur and Esther tells a simple story, yet ultimately nothing about it turns out to be simple. Neither member of the couple moves much away from where they start on the stage, as they pour out their hearts to the audience, sharing their memories, which are filled with regrets and confusions, as well as joy. It is a story about two people who loved, but lost each other, before they realized it was too late. Against a background of what looks almost like a Mondrian painting, Arthur starts his story taking objects, which don’t seem to connect with one another initially, out of a duffel bag. It is soon revealed that he is speaking to an invisible audience in the library he works at, after the place is forced to shut down. The abstract structures in the background turn out to be empty bookshelves. And Arthur declares that he’s going to kill himself. He goes through a book that describes twenty ways to do it, trying to decide the best way to go, as he reveals to the audience his experiences as a librarian, his wife’s affair with his friend, and more. We learn about his despairs and hopes, and the lighthearted way Arthur addresses the subject of suicide makes it even more gut-wrenchingly sad. On the other side of the stage, Esther starts her side of the story. The audience is told from the beginning that she is in "heaven," or some sort of realm in the afterlife. The couple intercept each other’s narratives to complete the story from their own perspectives. Playwright Howard has created two complex characters: they are both ordinary people with flaws. It is easy to like them in spite of their mistakes. Their story is tragic, but is told with warmth and hope. The language is poetic with hauntingly beautiful rhythms that capture the spectator's imagination with vivid imagery. 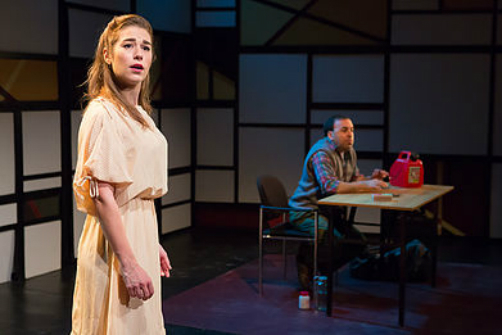 The simple staging of the story is sufficient for the play to appear sincere, and for the audience to focus on the depth of the characters and the beauty of the text. Arthur and Esther, in summation, is like an intimate art house film, well-written and well-executed, with two excellent performers. Arthur and Esther is by Ross Howard. Directed by Jerry Heymann. Set Design is by Brian Dudkiewicz. Lighting Design is by Michael O'Connor. Sound Design is by Andy Evan Cohen. Costume Design is by Samantha Rose Lind. Props are by Samantha Schaffer. Stage Manager is Erikka Anderson. The cast is Lucy Lavely and Steven Rattazzi.